We're back in NYC after yet another trip to Florida (we've visited the sunshine state 4 times already this year)! Two weeks ago we took a trip to Miami to celebrate our friend Blair's birthday, and we had such a blast. We've been to Miami quite a few times over the past few years, and each time we fall in love with it a little more. Miami has something for everyone- whether you're a beach bum, a foodie, an art connoisseur or you like an urban vibe, Miami is a perfect vacation spot. 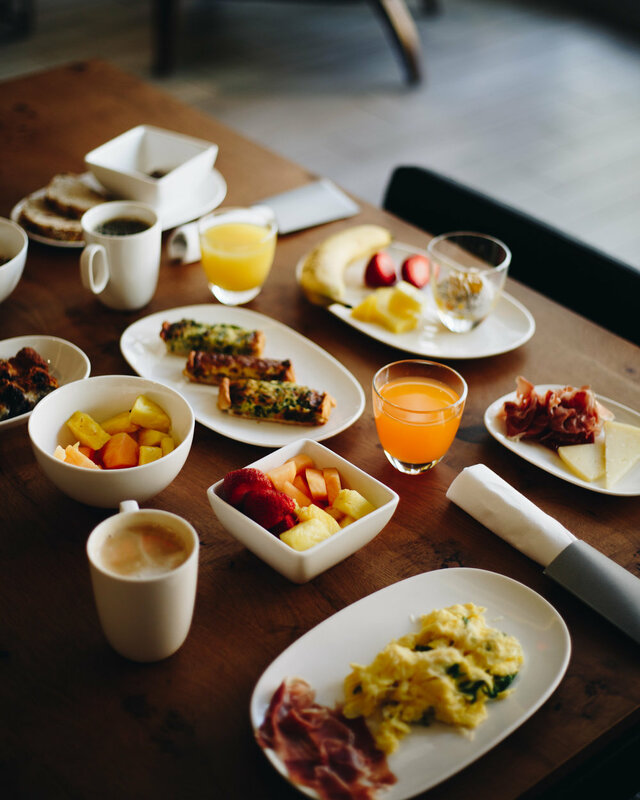 It's a quick 3 hour flight from NYC, and we find deals all the time- so it's easy to make a quick weekend or a full week out of it. 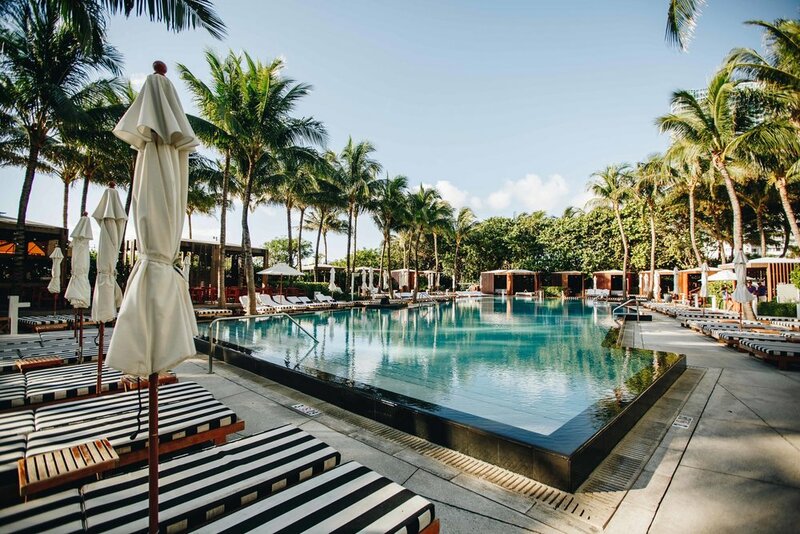 Miami Beach is home to a vibrant nightlife scene, and stunning resorts are a dime a dozen- so no matter your price range or taste, you can find something there! Every time we visit a new city (or return somewhere we've been before), we scour the internet for recommendations of what to do, where to eat, and what to see. It makes a trip so much less stressful when you can use someone else's experience to guide your own planning. So, we couldn't wait to share our ultimate city guide with you! 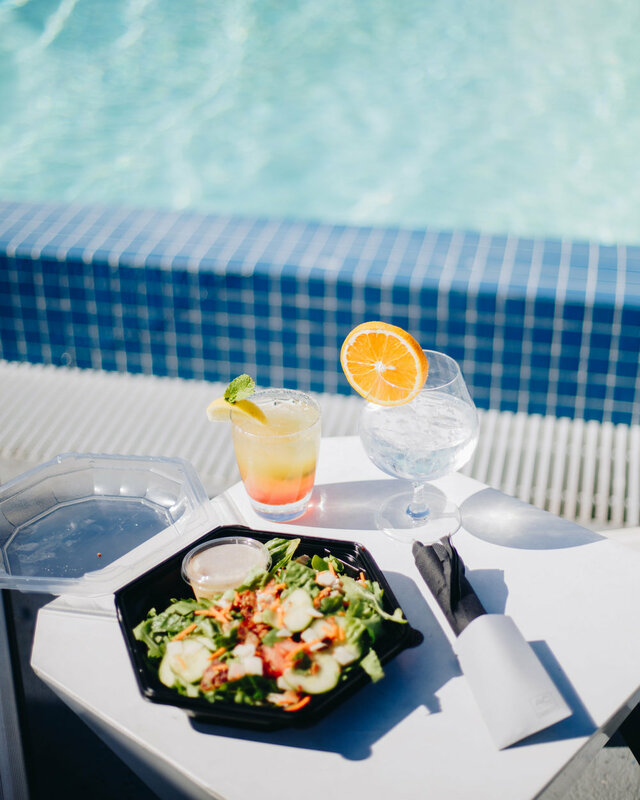 We've put together a list of our favorite places to stay, eat, drink, and our favorite things to do in Miami to get you started- so book those flights, pack your bathing suit and sunscreen, and get your Miami vacation started! 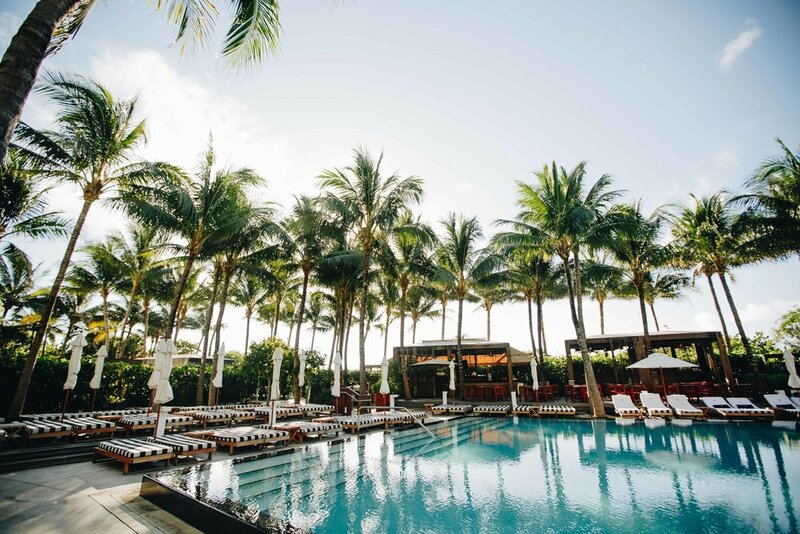 We always love the W Hotel brand, and our post a few weeks ago about the W Retreat in Vieques is a hard one to top- but the W South Beach is our favorite hotel in Miami by a landslide. We'd even venture to say it among our favorite hotels in the world! It's not the cheapest option, but the grounds, the service, the rooms, the beachfront location and the amenities prove the saying "you get what you pay for". This place is perfection! 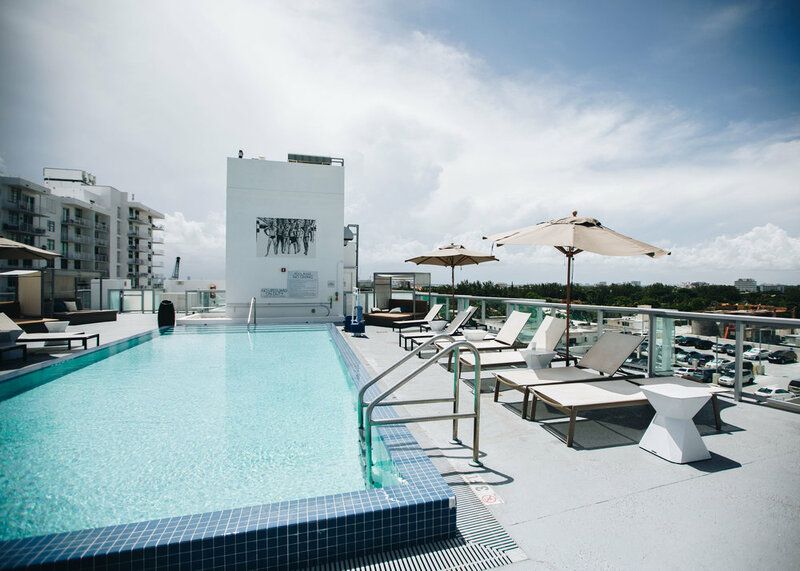 You can explore and book the W SoBe Here! If you're looking for a more economical option on South Beach, and you want to be close to it all but out of the crazy, AC Miami Beach by Marriott is a great option. It's minimal and to the point, but the property is new and very nice. There's a Starbucks connected to the hotel, a good restaurant/bar called Gin + Collins that serves great late-night food and a nice European style Breakfast. The resort fee covers beach chairs and umbrellas, daily fitness fitness classes (yoga on the beach anyone?! ), bicycles and more- but by far the best part of this hotel is the rooftop pool! 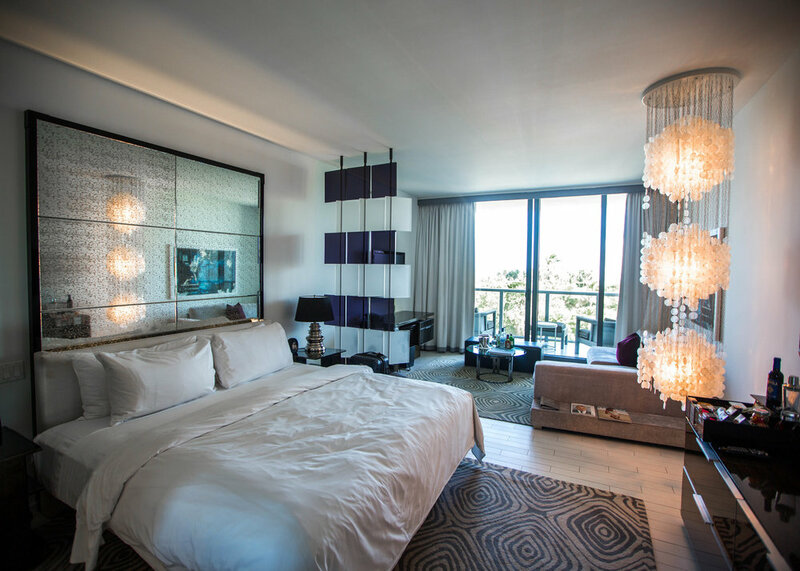 You can explore and book the AC Miami Beach Here! This fun hotel is a good middle-ground price option if you're coming to Miami for all the action! It's in the heart of South Beach, so it's a party all the time, and the daily free happy hour is always a good time. We stayed here a few years ago and had a great time (but it can be loud late, so if you're a light sleeper, ask for a room away from the bar!) There are several pools and bars with food, great amenities, it's a great price and a great choice! You can Explore and book the Catalina Beach Club Here! Stop for a coffee and a pastry on your way through Wynwood at this awesome local shop. You can watch them cupping and roasting their own beans while you wait, and the large patio out front makes for the perfect chill coffee shop vibes! This bar/restaurant behind the Freehand Hotel was one of our favorite stops this trip. It's a chill, relaxed spot with a nice tropical feel, and the drinks (and food) are fantastic. It's not fussy and it's a great escape from the wild South Beach crowd to catch up with friend over your favorite recipe- or try on of their daily cocktails and punch concoctions! Ok, let's be honest- this is our least classy option. It's a total dive, but you've got to admit that a bar dedicated to alcoholic slushies is the perfect spot to hit up after a long day in the sun (or in between club-hopping)! Our favorite slushie is the Bob Marley! 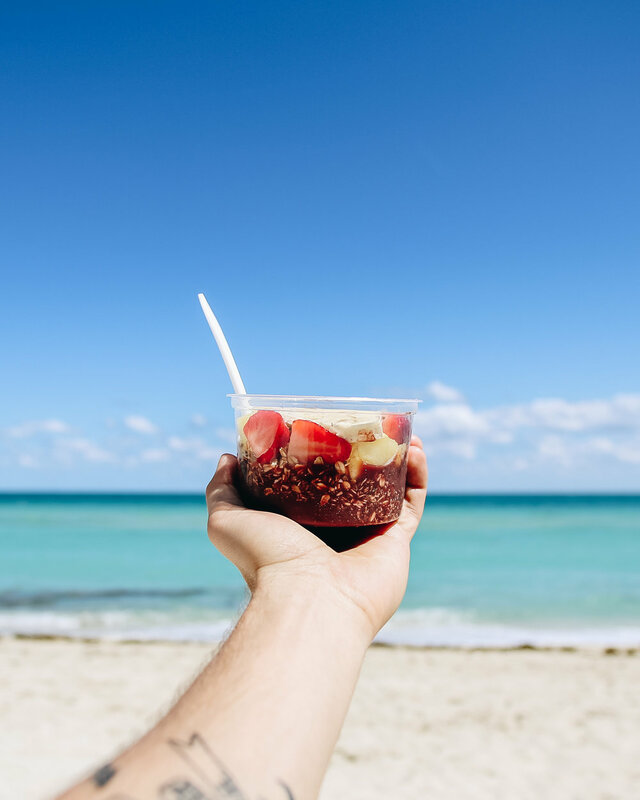 If you find yourself in North Beach, you've got to grab an Acai Bowl or a tropical smoothie from Athen's Juice Bar! It's a long-running favorite on North Beach, so you'll meet lots of nice locals who are always happy to give their recommendations for the best local spots! 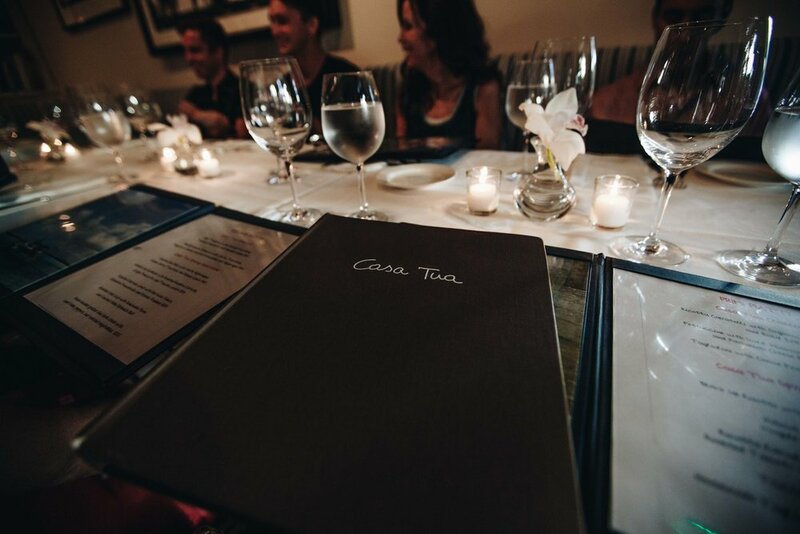 Date night is solved with Casa Tua! This romantic Italian spot is the perfect restaurant for a classy (and delicious!) dinner. The tables outside are private and gorgeous, surrounded by luscious greenery and candles, and the interior is a charming and intimate. The mushroom whatever is to die for, and you cannot leave without trying the tiramisu. This Wynwood joint offers moderately priced tasty food with lots of healthy + organic options. There's a lot to choose from on the menu- so it's a great spot for a group with varying tastes and health-consciousness levels. Try the mascarpone and raspberry stuffed french toast for one end of that spectrum, or the Kale salad on the opposite end! This spot is perfect for a relaxed sunset seafood dinner! Great happy hour with cheap oysters and seafood, a non-pretentious crowd, fun staff and a great west-facing marina view make this a wonderful experience all around! 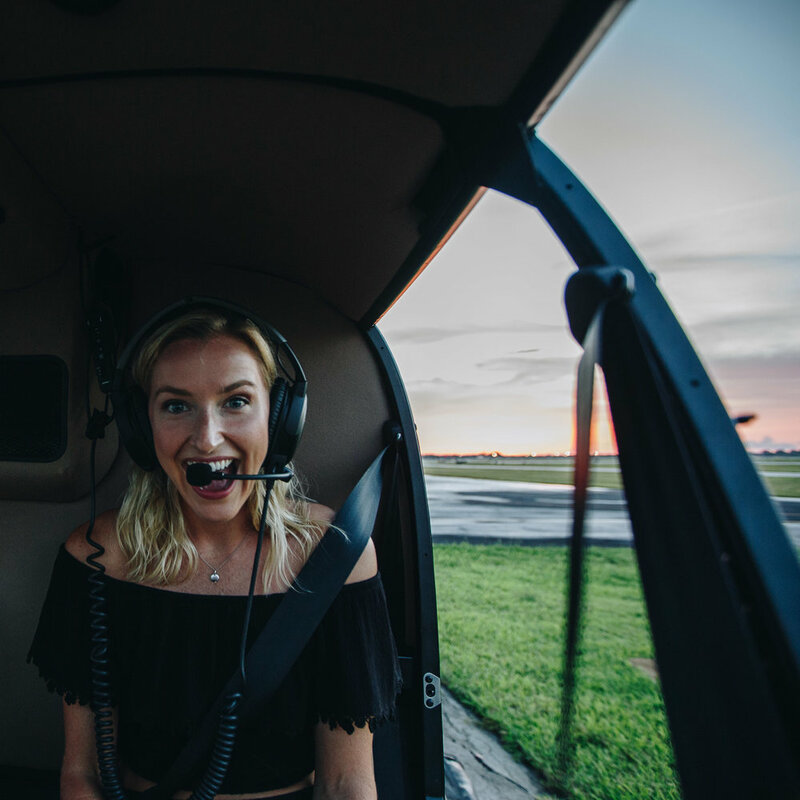 This is the most EPIC way to see Miami! 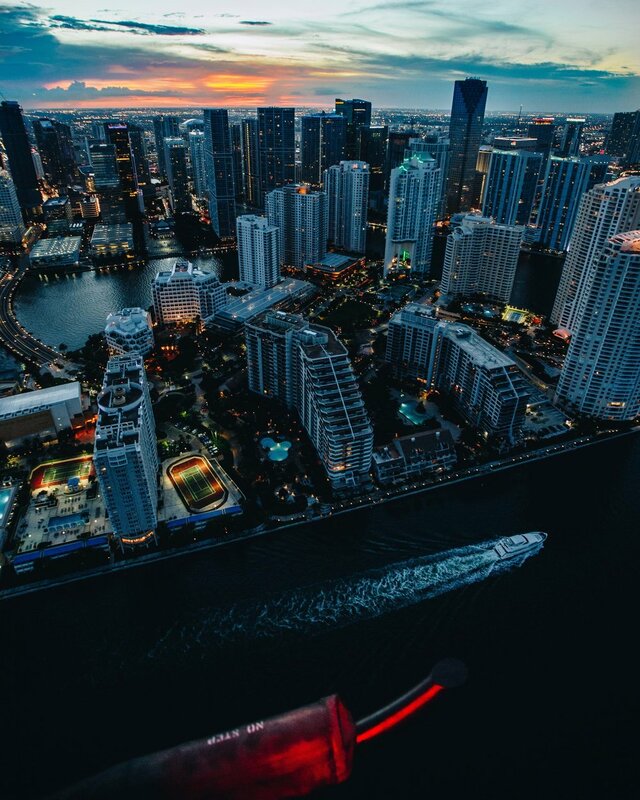 Fly Nyon Miami offers a doors-off tour that is worth the trip to Miami alone. Check out our video all about it below, and book your flight here! This place is a classic South Beach nightclub. Don't expect fancy or who's-who... but if you're looking for a fun night of dancing and partying, Mangos is good clean fun! This neighborhood is SO cool, and quickly becoming one of the hippest spots in Miami. We got serious Williamsburg Brooklyn vibes, and the murals on virtually every wall make this place as charming and inspiring as it is cool. 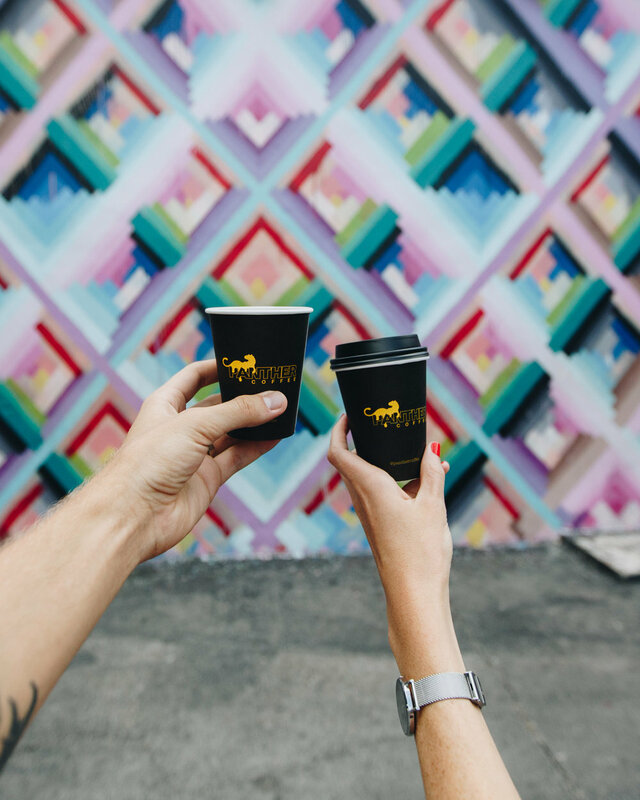 Spend a morning walking through Wynwood Walls, grab a juice at Jugofresh Wynwood Walls or sit and enjoy brunch at one of the many cafes- you could make a trip out of Wynwood all by itself! If you like shopping, spend an afternoon strolling through this outdoor mall. It's lined with shops and restaurants open late into the night, so you can always come back (or shop through) 'till dinner! This cool theater in North Beach plays great indie and film-festival flicks. We were lucky enough to catch Chris Burkard's "Under an Arctic sky" and meet him when we were in town! 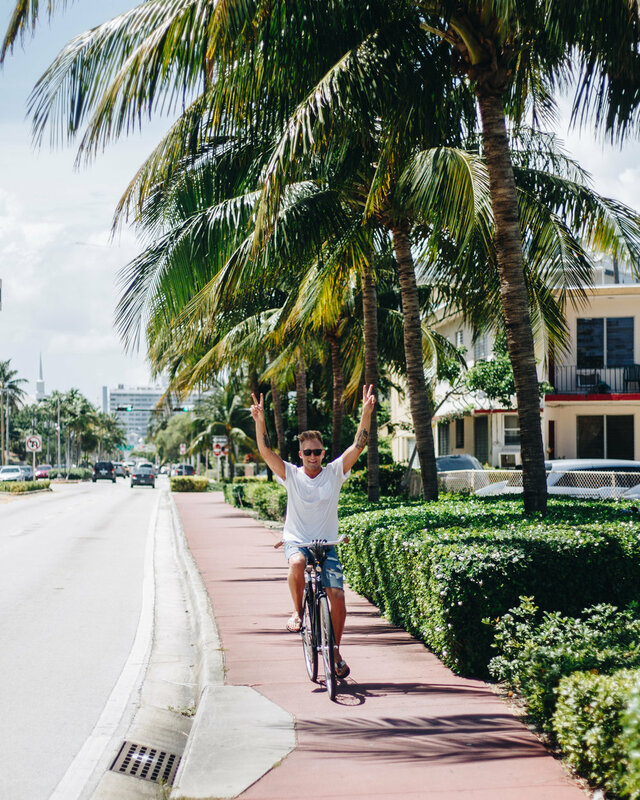 Many of South Beach's hotels offer bike rentals, and it's the perfect way to get around and explore! Cruise up and down the beach or the boardwalk with the salty breeze on your face and the sun on your skin! Ok... this is by no means an exhaustive list, but it's enough to get you started! Anyone have any of their own Miami favorites? Share them with us in the comment section below!